The Mount Everest south base camp in Nepal is seen a day after a huge earthquake-caused avalanche killed at least 17 people, in this photo courtesy of 6summitschallenge.com taken on April 26, 2015 and released on April 27, 2015. All of the climbers who had been stranded at camps high up Mount Everest by a huge earthquake and avalanches have been helicoptered to safety, mountaineers reported from base camp on Tuesday. 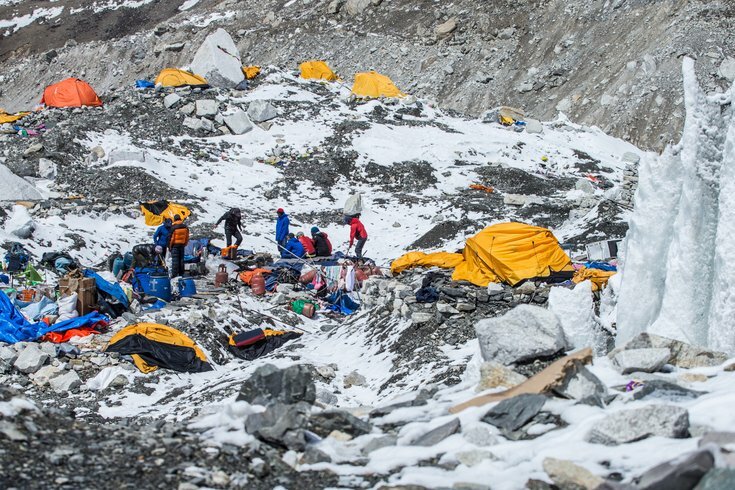 Eighteen climbers at Everest base camp died in Saturday's avalanche that destroyed half of the tents there, according to Nepal's mountaineering association. The huge cloud of falling snow and rock was triggered by a 7.9 magnitude earthquake that has killed more than 4,000 people across Nepal. Danish climber Carsten Lillelund Pedersen said his team had been trekking on Saturday down from camp 2, which is at an altitude of 6,400 meters, when it was caught in a whiteout and had to turn back. He eventually made it to camp 1. "Everest, above base camp, is now empty," Pedersen posted on his Facebook page. "A lot of gear, tents, oxygen, fuel etc is stashed a camp 2 ready to 'rebuild' later this season." With much of base camp devastated and many sherpas returning home to see if their families and houses are safe, some expeditions have been forced to cancel their attempts to scale Everest this year. Some, like Cienski, who plans to set a world record by scaling six 8,000-metre peaks this year, have yet to abandon their quests, despite the disaster that has overwhelmed Nepal. Seventeen climbers died at Everest base camp while one more passed away in hospital. Sixty were hurt, 21 of them seriously or critically, said Ang Tshering Sherpa, head of the Nepal Mountaineering Association.